When you have a boat on which to spend your lazy summer days off, life is great, and when you have kids to bring along for hours of family fun, life is even better. However, boating can be exceedingly dangerous, especially with little ones who haven’t yet developed balance or strong swimming skills. Water safety is important anywhere people swim — from an inflatable pool to the open ocean — and it is crucial to keep these tips in mind while you pack up for a day on the water with your kids in tow. · No running on the deck. Not only is a boat’s deck an ever-shifting surface, but it often gets wet and slippery. · No sitting in precarious places while the boat is underway. The side rails, foredeck, dashboard, sun pad, and swim platform are all viable relaxation spaces, but they become unsteady and unsafe when the boat is moving. · Never keep both hands occupied. It is wise to leave one hand open to grab steadying rails. A good rule of thumb is: one hand for yourself, one for the boat. Undoubtedly, you have other rules more appropriate for your vessel, such as “no swinging from ropes” or “no playing in the driver’s seat.” Learning about boat safety can actually get kids excited about their upcoming boating adventure, and you might find them playing imagination or memory games to help them remember the rules. Accidents can happen anywhere, but on boats, accidents can be particularly disastrous. Thus, to prepare for any unexpected events that incapacitate you and/or other adults, you should instruct your children in basic boating practices. Even young kids should know how to call for help on your boat’s radio. You can teach them how to speak into the radio’s microphone and call for emergency aid. If they show an interest in using the radio, you can also teach them so they can decipher incoming messages. Children love codes and secret languages, so you shouldn’t be surprised if they start using this parlance on shore. Older kids should be able to understand your boat’s chart plotter to relay coordinates in the event of a disaster. It may help to show your young kids where you are planning on sailing before you leave dock; as you are underway, you can ask them to keep a lookout for marker buoys. Then, when they are old enough to understand longitude and latitude, you can instruct them on the GPS. Not all boats are built for child safety, and your current vessel may be more appropriate for lone bachelor adventures than family fun. Family-oriented craft should be relatively gentle, offer plenty of space for storage and play, and have upgraded safety features approved by the national Vessel Safety Check. 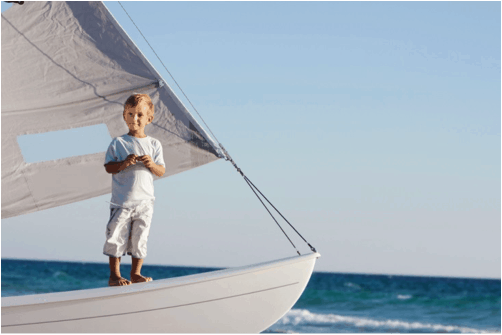 If you do need to swap your current boat for a child-safe model, you should consider donating your old vessel to a charitable organization. In most cases, donors receive a bigger reward as a tax break than they would selling their used boat, and it is a fast and guaranteed way to get the vessel off your hands before you acquire a more family-friendly model. You can find answers to questions about boat donation there. 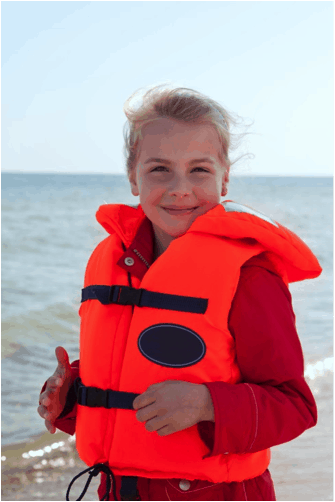 Most states legally require children under a certain age to wear an approved life jacket while they are above deck. Life-saving floatation devices come in five distinct types, each rated for different weights and uses. You should carry at least two life preservers for every individual in your family in case one device fails or you invite extra passengers to enjoy a day of boating. It is highly unlikely that you and your family will spend your days sitting calmly on your floating vessel. Boats are excellent recreational vehicles because they offer a wealth of thrilling activities for kids and adults, including swimming, fishing, and towing. However, as the excitement level increases, the potential for danger increases as well. Before you let your kids enjoy these activities on the open water, you should have them practice proper procedure while you are safe on land. For example, when mishandled, fishing hooks can cause untold damage with their sharp points, so kids should repeat casting and reeling in your backyard or park until the line goes exactly where they expect.